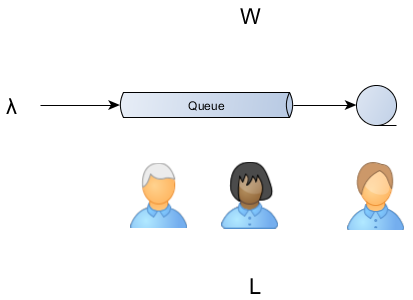 The queueing theory allows us to predict queue lengths and waiting times, which is of paramount importance for capacity planning. For an architect, this is a very handy tool since queues are not just the appanage of messaging systems. This behavior applies to thread-per-request web servers, batch processors or connection pools. Agner Krarup Erlang is the father of queuing theory and traffic engineering, being the first to postulate the mathematical models required to provisioning telecommunication networks. This is not strictly applicable to thread pools, as requests are not fairly serviced and servicing times not always follow an exponential distribution. A general purpose formula, applicable to any stable system (a system where the arrival rate is not greater than the departure rate) is Little’s Law. You can apply it almost everywhere, from shoppers queues to web request traffic analysis. A simple example is a supermarket waiting line. When you arrive at the line up you must pay attention to the arrival rate (e.g. λ = 2 persons / minute) and the queue length (e.g. L = 6 persons) to find out the amount of time you are going to spend waiting to be served (e.g. W = L / λ = 3 minutes). Let’s say we want to configure a connection pool to support a given traffic demand. Our connection pool can deliver up to 50 requests per second without ever queuing any incoming connection request. Whenever there are traffic spikes we need to rely on a queue, and since we impose a fixed connection acquire timeout the queue length will be limited. This queuing configuration still delivers 50 requests per second but it may queue 100 requests for 2 seconds as well. This spike would require 15 seconds to be fully processed, meaning a 700 queue buffer that takes another 14 seconds to be processed. Little’s Law operates with long-term averages and it might not suit for various traffic burst patterns. That’s why metrics are very important when doing resource provisioning. The queue is valuable because it buys us more time. It doesn’t affect the throughput. The throughput is only sensible to performance improvements or more servers. But if the throughput is constant then queuing is going to level traffic bursts at the cost of delaying the overflown requests processing. FlexyPool allows you to analyze all traffic data so you’ll have the best insight into your connection pool inner workings. The fail-over strategies are safe mechanisms for when the initial configuration assumptions don’t hold on anymore.